Apple has a new patent application published today by the USPTO (via AppleInsider), which details a stylus with a nib that can be extended to take advantage of multi-touch capabilities for a wider brush stroke, and that has built-in light sensors so that it can act as essentially an eye-dropper tool for the real world, capturing colors from physical objects to use in digital painting. The patent details a number of different options for a stylus tip or nib, including one which has variable sizing to determine how much contact it has with a device screen. Extending the nib could allow a user to do broad, edge strokes for wide lines, for instance, while shortening the tip would allow for drawing fine lines. It would be partially flexible to allow for it to bend when in use, which could make drawing varying line widths more natural for artists used to traditional media. Other designs include tips that can be changed out for drawing with different kinds of digital brushes, and a twist on the old select-a-pen idea where a group of fibrous strands makes up the nib. The strands could be reconfigured using a changeable exit on the stylus tip, meaning it could shape one continuous brush, a spread out arrangement of individual strands, or various other permutations. Apple’s stylus also details a nib with light sensors to detect visual feedback from the screen of a device like an iPad, and to communicate back to it via light as well, allowing the stylus to quickly change line width, color info, brush pattern and more on the fly instantly without any kind of wireless (i.e., Bluetooth) connection. The light sensors could also be used to pick up color information from real-world objects, so that you could sample the specific hue of your apple, for instance, and use that in your digital painting. 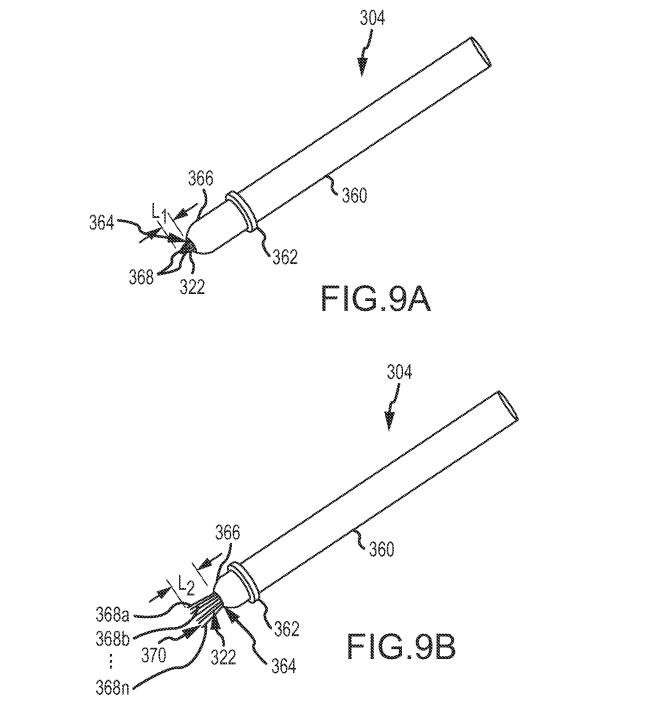 Other sensors, including accelerometers and gyroscopes, could be included according to the patent to give a better idea of the angle of the pen to change input type, too. These kinds of things are used in some Wacom stylus devices for input on their digital drawing tablets. Apple has never been too keen on the stylus. Steve Jobs famously said “if you see a stylus, they blew it” during a Q and A for iOS 4, and when he unveiled the first iPhone in 2007, he asked derisively “Who wants a stylus?” But the landscape has changed, and sophisticated stylus devices that offer highly-tuned input for drawing and fine detail work could be a great boon to those who want to use iOS devices for digital creation. Image depicted is a micro stylus, not an Apple creation.